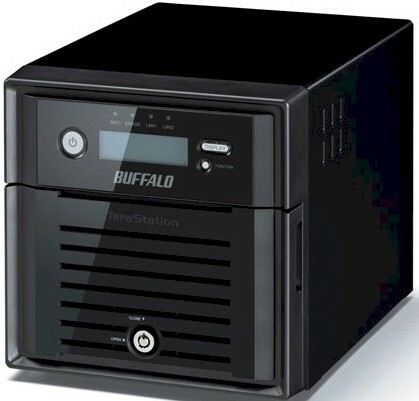 Back in June, Tim looked at the Buffalo TeraStation 5800 and he found much better performance than past TeraStations, but not enough to outrank the competition. Today we're going to take a look at the two-bay member of the new TeraStation family and see how it fares. Buffalo sent the TeraStation TS5200D0202 model for review, which is a 2 x 1 TB version. You can also get the TS5200 with two 2, 3 or 4 TB drives installed. The TS5200 front and rear panel callout diagram below shows the two aggregatable Gigabit LAN ports, two USB 2.0 ports, two USB 3.0 ports on the rear. There is no eSATA port, but there is a serial port for connection to a UPS. The front includes an LCD panel for status of the TeraStation, along with a myriad of LED lights for different functions. It also contains a VGA port for console access, which is behind the lockable drive access door. Both drives are hot-swappable. The TS5200 is not designed for easy main board access. In the image below, you can see the 2 GB SoDIMM. There is no "void if removed" sticker on it like some other vendors have, but Buffalo's documentation doesn't mention whether it's upgradeable either. The top view shows the TS5200's power supply sitting on top of the drive enclosure, with the main board tucked in down below. The key components for the TS5200 are summarized in the table below beside the TS5800's for comparison. We couldn't see the USB 3.0 device, but we're guessing it is the same NEC D720201 used on the TS5800. We used two WD Green 1 TB (WD10EZRX) drives that came with the TeraStation for testing. Power consumption measured 23 W with the two drives spun up. There is no idle drive spin-down. Noise of the NAS is classified as very low and would be fine for a home office, the exception being during boot when the fan runs on high.